Please submit a completed application along with your resume to info@klw-mfg.com. • Medical, dental and vision insurance. 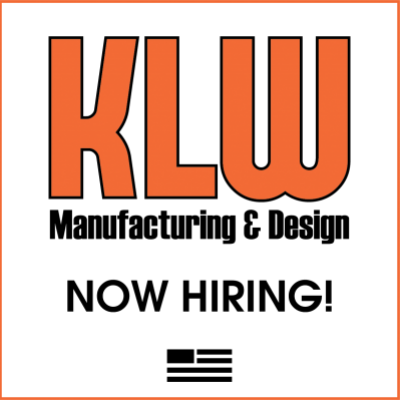 KLW covers 75% of employee-only coverage. • $15,000 Life Insurance Policy included with Medical and Dental benefits. Additional coverage optional. KLW Manufacturing & Design, Inc. located in Arlington, WA specializes in precision CNC machining and sheet metal fabrication and assembly. We are looking for motivated individuals who want to learn and work hard. No experience necessary; however, wage will depend upon experience and skill level. Wage advancement opportunities are available based upon performance and growth at management’s discretion after a 90-day probationary period. Candidates must have a stellar work ethic and positive attitude. A candidate with a natural mechanical aptitude is ideal. If you do not have any experience the manufacturing industry, a strong desire to learn and a positive attitude will be of utmost importance. We can teach someone how to perform tasks around the shop, but we can’t teach someone how to have a solid work ethic. We are looking for a candidate who supports our company values as we take pride in our shop and the work we produce. If this sounds like a good fit, please fill out an application.